April is the onset of spring in Malta, and while the weather is still fairly cool with an average of 18 degrees, you will be treated to a host of sights and activities that you would not see during the hotter months. Malta in April is a true delight. So, what is there to do on a weekend in April? Let’s assume that you arrive in Malta on a Friday afternoon and you have just got to your hotel. What next? Malta is more enjoyable when you have your own transport and one of the most cost-effective ways to do so is by using the GoTo electric car sharing service. Download the app, book your vehicle 15 minutes in advance and off you go; the world is your oyster. You can use exclusive GoTo parking and you only have to pay for the car for the actual period of use, literally by the minute. One of the best nights during the week to visit Valletta is on a Friday as you will find a mixture of crowds enjoying dinner followed by cocktails, luxurious gin varieties and whisky blends in the many bars around the capital cities. Valletta is a joy to walk through at any time, but if you can catch the last of the sun rays filtering down and reflecting off the magnificent Triton Fountain and City Gate entrance, you are in for a real treat. Follow it up with a sumptuous dinner and a relaxing glass of wine at any bar that takes your fancy; you won’t be disappointed. Saturday’s are made for walking! Get up bright and early and make your way over to the South West of the Island to visit the Blue Grotto in Zurrieq. The view over the clifftop down to the grotto is absolutely spectacular, and if the weather is good, you can take a traditional boat to see the intense blue reflections in the caves. Keeping to the west of the island, you can make your way over to Ghar Lapsi for more stunning water views and walk along the sheer edge of Dingli Cliffs. You might be hungry by this point, so you can either eat traditional rabbit in Dingli or drive up to Mdina, the old Capital City. You cannot park in Mdina (it’s called the silent city) but you can enjoy a fabulous lunch on the ramparts and follow it up with a visit to Fontanella, which every Maltese person will tell you has the best chocolate cakes on the island. There are killer views too! It might be pushing it to do dinner after a day like that, but you can eat local in any village, town or city in Malta and you will be hard pressed to get a bad meal anywhere. Take it easy, go for a saunter down Sliema front, roam around Valletta or any other town you may be staying in. 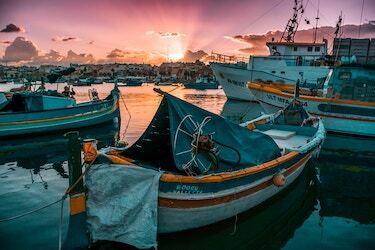 Everyone in Malta knows that the best thing to do on a Sunday morning is get up bright and early and head down to Marsaxlokk for the fish market. You cannot get fish fresher than this and you can see restaurant owners taking their pick of the catches that are brought to shore. After taking in the sights and sounds of the market, you’re probably going to be mighty hungry. The choice of food in Marsaxlokk is a no-brainer – seafood all the way. After lunch you could drive up to Birzebbuga to visit the fabled Peter’s Pool – natural swimming pools that are crystal clear blue. Alternatively, you could head to Golden Bay on the West Coast to experience a sandy beach. It might not be warm enough to swim, but there’s something magical about taking off your shoes and walking along the beach. It might be a bit nippy, so you will need a jacket, but you can round off your Sunday with a walk along any of Malta’s seafront promenades. The yellow hue of light gives it a charm of its own, and sipping an espresso or a cappuccino and watching the world go by is about as Maltese as you can get. Sadly, just like that, the weekend’s over. Hopefully you’ll be staying longer to enjoy more of the country, but if your time’s up, this itinerary will have given you a good taste of what you can enjoy next time round when you come visit for a longer stay.